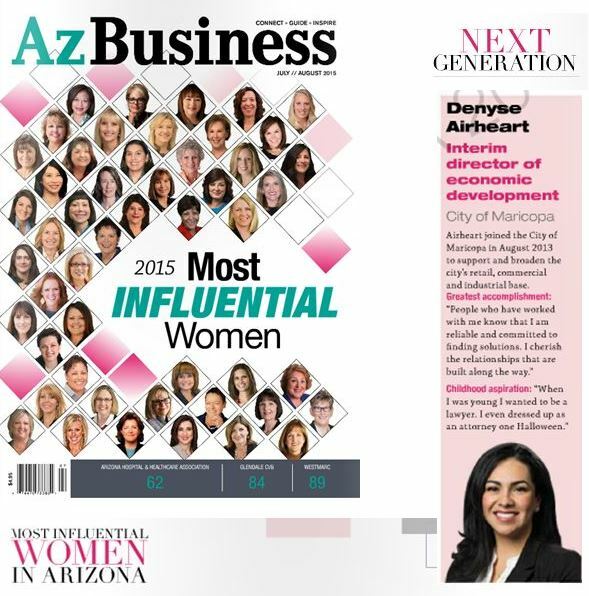 City of Maricopa Interim Economic Development Director Denyse Airheart was recognized in Arizona Business Magazine’s 2015 Most Influential Women issue as one of five “Generation Next” women who are making an impact on Arizona, even though they are less than 40 years old. Denyse joined the City of Maricopa in August 2013 to support and broaden the City’s retail, commercial and industrial base. Ms. Airheart manages a number of noteworthy tasks such as marketing the community to retailers and employers, the business retention and expansion program, shop local and the Maricopa Advocate Program. Denyse takes pride in serving as a liaison to the business community, citizen committees, non-profit organizations, special interest groups and neighborhoods by proactively providing information specific to the City’s economic development department.